Precedence is a unified field theory of direct sound spatialization and positioning. It produces a self-modulating stereo-image that creates an instantaneous sense of width and presence similar to stereo microphone techniques used in live acoustic spaces. Precedence then uses psychoacoustic principals to position the image within a virtual stage giving ultra precise left-to-right, and front-to-back distance localization, which together with 2CAudio reverbs, creates an incredible sense of hyper-realistic 3D space and specific positioning within this space. Note: The full manual will be online shortly. More audio demos will be added over the next few weeks as the community all begins to jointly explore Precedence. Until then, please try the demo versions on your own material as that is what matters most anyway. You are undoubtedly familiar with traditional gain panning and have perhaps heard of slightly more advanced techniques such those relying on the Haas Effect, binaural hearing, Head Related Transfer Functions (HRTF) and similar topics. Precedence lives within the same universe as the aforementioned techniques, but offers some very novel developments, and a unique organic morphing functionality that drastically enhances its effectiveness over both headphones and loudspeakers while avoiding the innate weaknesses of each of the above techniques. In addition to delivering perfect control over horizontal angle or azimuth, Precedence also offers precise control over an instrument's apparent distance from the listener allowing users to achieve incredible front-back depth and distance placement, which is highly desirable in applications such as scoring and orchestral work. Furthermore, Precedence is designed to intelligently integrate with 2CAudio reverbs such as Breeze 2 to achieve an unprecedented degree of realism in instrument placement within a unified virtual acoustic space. Move out of flatland, experience higher dimensions of spatialization, and achieve precise and purposeful positioning in all directions. The missing link in the next evolution of spatial sound has been found and is avaible today. Take Precedence over spatially inferior mixes. We have been extolling the merits of subtle organic modulation in spatial processing ever since the first release of a Aether 1.0 ten years ago. In Precedence we bring modulation to the direct sound itself, augmenting its instantaneous spatial impression and giving it a sense of presence that is so convincing it's downright spooky. If you close your ears you may be tempted to try to reach out a touch the ghosts of the performers in the air between your studio monitors. Fear not however, as this is no Halloween trick; it's all treat, and your mixes will be more alive than ever. Reanimate dead mixes with an efficacy that would make Frankenstein green with envy, and whisper an extra helping of angelic breath into already great mixes. Modulation applied in Precedence is unlike any technique used in our reverbs, and preceding Breeze 2, B2, or Aether with Precedence augments the spatialization found in our reverbs, taking it to even higher levels of hyper-real. Early Reflections will dance with subtle life and tails will become sweeter than a basket full of the most succulent Halloween candy -- without the tooth decay. Life is full of color. We find it everywhere: in nature, in art, in culture, in sports, and even in political offices these days. Why should software GUIs be any different? With the release of Precedence and Breeze 2 we are introducing our new Chameleon Color user preference system for all our products. This system allows extreme user control over the hue, saturation, brightness, contrast, vibrance, spectral intensity, color harmony, and other more macro design choices in our GUIs. Huge variations in GUI appearance are now possible, from subtle, elegant and professional refinement, to boisterous frisky frolics that inspire creativity and scream "be different". Approximately 150 different Color Preference Presets are supplied pre-made as well. Of course a huge number of GUI sizes are available as well for further customization. Have it your way. Life's a box of crayons. Like Breeze 2.0, Precedence is so efficient that it is easily possible to run over one thousand instances on the latest desktops and workstations such as Apple's new iMac Pro and Intel Skylake-X and Xeon based Windows machines. Running a separate instance for every performer in an entire 100-person orchestra to achieve new levels of realism for example, is now quite literally a breeze on modern CPUs. Breeze 2 and Precedence represent the first pro audio software of any kind to be optimized for Intel's new AVX-512 instruction set and performance is simply staggering on CPUs that support it. Performance on recent laptops and older machines is equally impressive. Ultra low CPU usage is great, but there is one thing even better: zero CPU usage! Beginning with Precedence and Breeze 2.1, we have now introduced an intelligent Suspend-On-Silence feature in our products. If the plug-ins are not receiving any input signal, they will automatically disable processing, and enter an approximately zero CPU usage state! This is huge news for composers who use massive scoring templates and like to auto-load hundreds of instances. 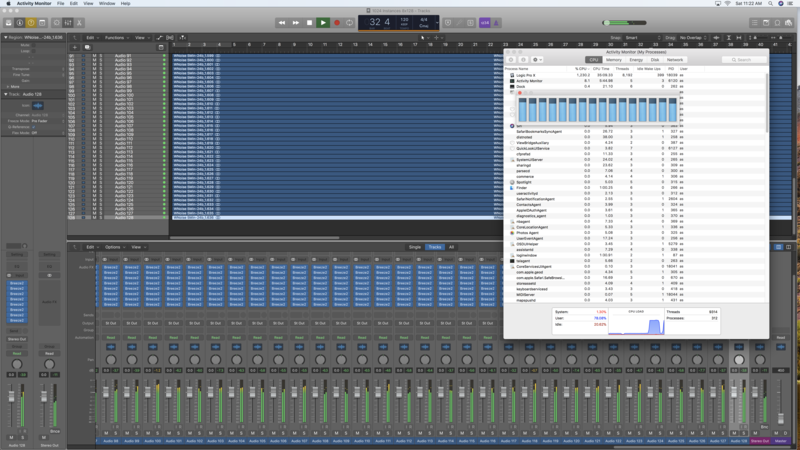 Maximum CPU usage will only be reached in such cases when all tracks in the project are active at the same time, which almost never happens in large sessions. Sparse arrangements can save orders of magnitude in CPU-resources, which in turn leads to more creative freedom and less annoyances such as heat and fan noise generated by powerful computers in the studio. Furthermore, if playback is stopped for a coffee break, lunch break, or overnight, processing is automatically suspended, potentially saving you significant money on your electric bill. In other words, we automatically turn the lights off for you, helping to save the planet in the process. We think that is pretty cool. Keep Cool With Zero CPU Usage! Precedence is available for AU, VST, and AAX hosts under Mac OSX.8 or higher including Mojave. Precedence is 64-bit only on OSX. Precedence is available for VST and AAX hosts under Windows 8 and Windows 10. Both 64-bit and 32-bit versions are provided for all formats. The 64-bit version of Precedence also works in 64-bit hosts on Windows 7 64-bit. Windows 10 64-bit is recomended and is the focus of our ongoing development efforts. The minimum CPU instruction set requirement is SSE3. Even better performance is found on recent CPUs with AVX instructions. The first CPUs with AVX instructions were the Intel Sandy-Bridge generation orriginally released in 2011. Precedence is optimized for AVX, AVX2, and AVX512 instruction sets. Breeze 2 was the first pro-audio software product of any kind to offer AVX-512 optimization. We beleive Precedence is the second. These two remain the only audio software on the market to support AVX-512 so far that we are aware of. Performance on machines that support it, such as Apple's iMac Pro, and systems built around Intel's Skylake-X, Xeon-W, or Xeon-SP CPUs is simply incredible. Precedenc's proceedureal GUI system requires Open-GL support. Most existing methods of stereo imaging and positioning suffer from unfortunate weaknessness. Gain panning is of course the most simple to implement and is ubiquitous throughout the last 100 year history of recording arts and sciences. Unlike some of the more modern methods, it is generally free from any nasty unwanted side effects. There remains one rather large issue however: it generally does not occur in real-world acoustic environments -- at least not to the degrees and intensity offered and commonly used by mix desks and modern DAWs. A hard-panned signal is not particularly natural especially on headphones for example. Drastic level differences between ears, or stereo microphones simply almost never occur in the real world. In the real world the only equivalent would be something like a young lover whispering directly into only one of your ears, and while this may seem nostalgic indeed, it simply does not really translate to the experience of musical instrument performance in acoustic environments. There is almost no desirable circumstance in which someone could hear a violin, trumpet, piano, drums, or vocal in only one ear. Of course play-back of gain-panned signals in-air over loudspeakers results in sound reaching both ears even if sound is emitted from only one of the loudspeakers. Some mixing in-air certainly occurs, but not necessarily in physically accurate ratios relative to the original sound field. More problematically this method completely ignores other important interaural differences that occur in nature. Gain panning is used widely because it is mostly safe to use, not necessarily because it is the best choice aesthetically or provides the most accurate directional cues. Differentiating a large number of instruments in a mix based solely on gain panning is extremely difficult and often results in poor separation between instruments. In the real physical world a sound coming from a source that is closer to one ear or microphone will arrive at this ear or microphone before the other more distant one. In technical terms this is called an Interaural Time Difference and in human perception this cue has a significantly stronger perceptual impact than Interaural Level Differences (i.e. gain panning). In psychoacoustics this phenomenon is called the Precedence Effect or the Haas Effect as named after one of the first scientists to explore it in the 1950s. It is also known as the Law of the First Wavefront, which attempts to convey the salient point that the first wavefront to reach either ear will take precedence over the one arriving slightly later in the second ear, and the sound will be perceived to be coming from the direction from which it first arrived. Haas showed that this effect was so strong that it would even beat significantly conflicting Interaural Level Difference cues. In other words, even if the later-arriving signal was significantly louder than the first-arriving signal, the listener would still perceive the sound to be coming from the direction where the sound arrived first. Time-Delay based panning therefore is often significantly more powerful and effective than gain panning. Binaural panning techniques incorporate both Interaural Level Differences and Interaural Time Differences as well as other psychoacoustic effects such as Interaural Spectral Differences in effort to attempt to model human hearing as exactly as possible. Head Related Transfer Functions can be used to create filters that change the frequency response independently in each ear based on the real-world physical size, geometry and materials of human heads and ears. The head can create a shadowing effect on some frequencies at certain azimuths, and the pinna of the ear also creates very complex filtering effects in each ear depending on the source sound positions. These techniques can be extremely convincing under some circumstances and have great application for fields such a Virtual Reality. Unfortunately the circumstances in which HRTFs really work well are very restrictive. Namely these techniques really require headphones for the best result, and even then, HRTFs do not always translate well from one person to another due to quite large variation in human pinna size and shapes. A unique custom set of HTRTFs for each user is the ideal solution but is obviously very impractical. Furthermore, interaural filter effects are extremely sensitive to head position, and indeed this is likely part of their evolutionary design. If humans are forced to keep their head perfectly still their spectral-filtering based localization abilities are decreased significantly. The ear is basically designed to take multiple snap-shots of a source sound from different angles and then effectively triangulate a position based on how the filter effects in the spectrum of the source sound change depending on head angle. If you have ever observed predator animals in nature or those who were trying to avoid them, and wondered why they move their head rapidly in a jerky start-stop manner, you now know why. They are attempting to better locate a respective meal or avoid becoming one. Some form of head tracking and dynamic filter computation would be required to get really convincing results with HRTFs. Again this may find application in Virtual Reality, where head tracking may be incorporated into VR headsets, but it is generally way too cumbersome for professional music applications and simply does not work over loudspeakers. Both pure Time-Delay based panning and Spectral based techniques also create other potential issues such as concerns over mono-compatibility and introduction of potentially strong coloration of reverb tails if such techniques find their way into the signal sent to a reverb device. Both techniques introduce a form of comb-filtering and if such filtering is altered downstream either by collapse to mono or by recirculating through feedback in an algorithmic reverb the result can be unpleasantly obvious. In general these type of strong comb filtering effects are highly undesirable and often cited by music engineers as a reason for avoiding simple Haas panning and anything based on HRTFs. This is in large part why pure gain panning persists today. Precedence utilizes some variation of all of the above techniques, but does so in a novel manner that largely avoids the issues associated with more advanced time and spectral methods. It uses a proprietary mix of the perceptual cues humans use to locate sounds in 3D space that has be optimized specifically to work within the needs of music and professional audio production. The relative strength of these cues can even be adjusted to suite the needs of a wide variety of musical styles. Precedence's lateral azimuth positioning ability is extremely convincing over both loudspeakers as well as headphones. It is largely mono-sum compatible even at extreme settings, and if exactly perfect mono-sum compatibility is required it can be guaranteed as needed to avoid bass cancelation in club systems for example. Precedence also offers three input modes to maximize compatibility with the needs of user's audio tracks and sample instrument libraries to avoid this additional potential source of unwanted coloration from spatial information contained within the source sound. Precedence is designed to be used as an insert directly on individual tracks, and therefore its output will inevitably find its way into reverbs whether placed directly after Precedence on track inserts, or on sends. Unlike other techniques such as HRTFs, Precedence will cause absolutely zero negative consequences when used this way, and the reverb tail will not be undesirably colored as an unwanted side effect. Indeed 2CAudio reverbs such as Breeze 2, have been designed to be used specifically with Precedence in mind. Both are extremely efficient and mid-level recent CPUs can run hundreds or even thousands of instances of both simultaneously to allow users to perfectly spatialize and position every single performer in an symphony orchestra performance simultaneously if desired, all with independant and dynamically modulating settings. The world's best algorithmic reverbs such as our own a Aether, a B2, and Breeze 2 have quite masterfully perfected the art of diffuse field late reflections for some time now. Our tails have been silky smooth since 2009 and have only gotten better with each generation of our products. Our ray-tracing-based Early Reflections Engine in a Aether, and more abstract approach to Early Reflections in a B2 and Breeze likewise do a good job of creating strong spatial impression complimenting the envelopment offered by our tails. In short we create very convincing spatial impression and sense of envelopment with somewhat abstract yet infinitely variable spatial models. For solo instruments this is a very convincing illusion. For use in multi-track sessions there is historically something of a complication. In the hardware days of yesteryears, the hardware devices where so expensive that most studios had only one or two that were shared by all instruments via using them on send buses. More recently in DAWs the same practice was typically continued do to limited CPU power a few years ago, and the relatively high CPU usage of full extreme algorithms such as a Aether and a B2. Many engineers also advocated using shared reverbs on sends to do the convenience of being able to change the reverb settings globally as well, which is admittedly convenient we agree. Using a shared reverb instance or two may be a reasonably acceptable compromise for diffuse late reflections, but it is a quite incorrect from the physical perspective for Early Reflections as it is the physical equivalent of having all source sounds occupying exactly the same position within the virtual acoustic space. Even if a Aether or a B2 supplies an immaculately sublime spatial model, if we send 20 instruments into the model and have them all coming from exactly the same point in space within this model, the result will still be less than perfect. In the real world the 20 performers would be occupying different locations within the shared space. We can of course apply gain panning to the tracks pre-send, but as explained above this is somewhat artificial and does not really properly position them within the space. It does nothing to change the time delay lengths that happen in the real world depending relative source, listener and boundary positions. We could instead use separate Early Reflections engines directly on each individual tracks and reserve a few instances on sends to supply shared diffuse late reflections. This works relatively well, and we have advocated it back as far as 2009 with a Aether. One complication here is that sending early reflections into tails usually results in some degree of coloration of the tail, which may or may not be an issue. Secondly there is no easy way to correctly control left-right positioning. If you insert a Aether on a track, and then pan the track in the DAW, the entire track will be shifted including it's reflections and this is not physically accurate. Furthermore you are still relying only on gain panning which is not the most physically accurate. Finally, you have no easy way to independently control the delay between the direct sound and early reflections and the tail for each instrument, which is a critical perceptual cue for depth and distance positioning. Beginning with Breeze 2.0 in early 2018, we solved several of these issues by creating a reverb that is so efficient that you can easily load 100 (or 1000 or even more) different instances directly on each track. Each new instance will automatically produce a variation of itself so that instruments will feel part of the same space, but occupying different locations within that space. Early Reflections patterns and even the diffuse tail for each instance will be different as would happen in the real world. An infinite variety of more drastic mutations of each preset are a click away as well, and allow you to find a magic sweet spot for each instrument. This is already a great step forward. The next step is to offer purposeful control. Breeze 2.0 allowed you to create multiple instruments that all occupy a different location within a unified space, but it did not allow you be specific about where they are within this space. If you are trying to recreate an orchestral stage for scoring work for example you will have to utilize some other tools together with Breeze 2 to achieve this. Most likely this would have previously involved the track panner, but once again this is generally post insert, and now you are panning your direct sound, your early reflections and your tail. To be blunt, shaking your tail is one thing, but panning it is something else entirely! It is physically incorrect and will not sound authentic and is still only using gain panning. Even more importantly, to achieve authentic front to back distance positioning other psychoacoustic cues should change between instrument instance such as the wet/dry balance as well as the pre-delay amount. These can be set by ear or via using precise calculations for those knowledgeable and diligent enough to do so, but the process is tedious. Furthermore, the direct sound itself should also change some depending on its position following very sophisticated processes. This is what Precedence achieves for you. Precedence precedes all of your other spatial tools. Precedence comes first in your spatial processing chain. Precedence will impeccably position your source sound laterally left-to-right controlling its azimuth angle using techniques that will work perfectly with all reverbs that follow it without creating unwanted side effects. Precedence will also pre-condition the direct sound to give it an instant sense of audio source width and spatial impression, similar to what early reflections are typically used for and will do so in a variable manner that embeds distance cues into the direct sound itself. Precedence can then be followed by a Precedence-aware reverb such as Breeze 2.1, which can be set to manually link some of its internal settings to Precedence simply by setting Breeze 2.1's Mix parameter to the same value as Precedence's Distance parameter. Breeze's Mix, Pre-Delay and other internal aspects will now sync to Precedence's Distance parameter to create the correct Initial Time Gap and Direct to Reflected Energy Ratio, which are both essential to the psychoacoustic perception of distance. This takes the guesswork out of setting an appropriate Pre-Delay value for each instrument, which is a very important topic in orchestral stage positioning yet remains largely misunderstood and difficult to correctly set up using standard tools. Using Precedence directly on track inserts together with shared reverbs such as a Aether or a B2 on sends will also still be a dramatic improvement over standard methods if you prefer not to manage many instances of reverb directly on track inserts. When used this way Precedence will still correctly laterally position each instrument, add some distance cues, and also add some modulation that will have the effect of slightly randomizing the Early Reflections independently for each instrument that is send to a shared reverb on a send. This alone is a huge step in the right direction and can work very well for small ensembles.